Is your website costing you cases? When you spend money on digital marketing for your law firm, you expect a return on your investment. Ideally, this return takes the form of new cases that result in revenue and profit for your firm. If your law firm isn’t generating new clients from online traffic, it’s time to take a long, hard look at your website. If your website is dated or your messaging or online marketing strategy is off, you might be losing out on leads and cases. Here are five major issues that the team members at Page 1 Solutions often see when attorneys contact us for help with their website and digital marketing. You have already heard that Internet traffic on mobile devices like smartphones and tablets is growing rapidly and is already starting to dominate over desktop traffic. Most of our clients already see the majority of their traffic coming from mobile sources. This rise in mobile traffic signals the necessity for website design and development that isn’t just mobile-responsive or mobile-friendly, but mobile-first. Mobile users expect Web pages to load quickly on their devices, have accessible navigation, be easy to scroll and prominently feature calls-to-action (for attorneys, this would be a phone number users can click to call). Law firms that rely on websites that are just shrunken versions of their more robust desktop sites (or, worse, use a bare-bones mobile-specific domain) will see diminishing returns. You likely have an iPhone, Android or other device that your prospective clients are using to surf the Internet. Pull up the website for your law firm on this device. Are you satisfied with the site speed and user experience? Now, using that same phone or tablet, compare your website to those of a few competitors. Do their sites look and work better on the device than yours? If the answer is yes, your first marketing investment in 2018 should probably center on mobile website design and development for your law firm. Whether you invested in a custom website design or opted for an inexpensive template, the look of your site says a lot about your firm. And, for some users, a lackluster design can also say more than enough. Visuals are usually the first thing visitors notice on a website. The logo, colors, photos and even fonts that you use tell a story. Make sure you’re telling potential clients the best story about your firm. Clients aren’t finding you on a computer like this. One of the biggest giveaways that a website is out of touch is the use of stock photos featuring the clothes, fashion and technology of yesteryear. Your potential clients today aren’t wearing Nehru jackets or driving AMC Gremlins, so why are the images on your website dominated by scenes from 20 to 30 years ago? Custom images of your team and your office are best for building rapport with visitors to your website. Stock photos are helpful because they break up Web pages full of text, but make sure the pictures look like something your clients would realistically see in their community. Similarly, your logo should be crisp and clean, not look like it was photocopied from letterhead and then scanned to the top of your website. On modern websites, logos play a dual role of branding component and interactive link for returning to the home page, so make sure your logo is something users see and want to click. First and foremost, showing up on the first page of search results is not the chief sign that your website is successful. Consistent appearance at or near the top of search results is good for your law firm’s exposure and may result in more traffic and leads, but prime placement on a search engine results page (SERP) is not the be-all, end-all that your marketing agency might be telling you. Is your law firm ranking for the RIGHT terms, rather than the most? Lawyers who target extremely competitive search terms struggle to gain ground, especially if their competitors have established websites, massive advertising budgets and fine-tuned campaigns. But your optimization strategies can also become outdated and limit your lead generation. Do your Web pages obnoxiously repeat the same phrases in text, no matter how unnatural the context? Is the page written to appeal to a robot rather than a human being? Could the content just as easily describe your competitors as your own firm? These are just a few questions that could indicate your website uses outdated, ineffective SEO techniques. Like the user experience and website design aspects mentioned above, putting yourself in the user’s position can help you pursue more effective optimization. Online traffic from search is not wholly dominated by just a few high-level keyword phrases that every law firm pursues. The queries users enter in a search engine are as varied as language itself. Study Google Search Console and Google Analytics to see what queries bring visitors to your website and what they do when they get there. By investing your time into this research, you can optimize your website for the phrases that actually bring you clients, rather than high-volume keywords that translate into limited value for your firm. What is your website telling potential clients about your firm? Customers do business with people they trust. Clients who hire lawyers are the same, and your law firm website is often the first opportunity to start telling non-bonded prospective clients who you are. Making photos of you, your fellow attorneys and your office staff a focal point of the website design is a good first step. Extend this personal touch to all aspects of your digital marketing, from social media to original videos. Online advertising is so ubiquitous that many users unconsciously ignore ads. The aversion to ads and decreasing attention spans (or “banner blindness”) means that your firm has to stand out to capture leads and cases. Custom, eye-catching collateral like images, videos, and downloadable content sweeten ads, giving users a reason to stop scrolling or swiping and see what your firm has to offer. Attorneys complete extensive education and training to practice law, and they are justifiably proud of what they have accomplished. Your law school, previous positions, certifications, court admissions, awards and other achievements are all an important part of your background. So are the verdicts and settlements you have achieved. It is tempting to think of your website as an online CV. Unfortunately, that is a huge tactical error. However, when marketing your law firm, it’s important never to rest on your laurels and think that it will bring you cases. Most clients know one thing when they start looking for a lawyer: They need help. Yes, the best attorney for their case might be you because of your background, but overloading visitors to your website with a list of schools, titles, awards and other plaudits is rarely beneficial for your marketing. In order to convert website traffic into leads and cases, you need to explain how your background aligns with their needs, not just why your background makes you a great attorney. 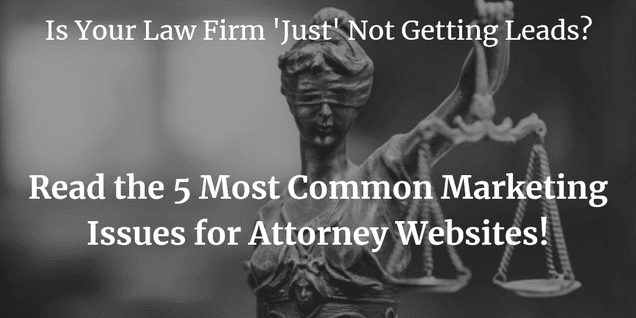 Your website is a resource for potential clients, but don’t rely on legal jargon or overly technical explanations that make you sound more like your law school professor than an attorney serving members of the public who don’t have a legal background. Content explaining the cases you accept should be informative and engaging, with a call-to-action that encourages the user to call your office. Pages about your law firm and your online bio are the best place for details about your background, but keep the information accessible. And don’t hesitate to touch on the “lighter side.” Information about charities you support and what you do outside of the office make you more relatable and crystallize your connection to the communities you serve. Great law firm websites and marketing campaigns thrive on trust. Converting website visitors into clients is a lot like building the attorney-client relationship: You need to earn their confidence to land the case and pursue it to a successful conclusion. Get more leads and clients with a modern, mobile-first, optimized website. For your law firm to achieve a good marketing ROI and generate cases, your website needs to tap into the needs and expectations of potential clients, deliver an outstanding user experience that drives conversions and present your law firm as an approachable authority that can help in their time of need. The best practices discussed in this article can help guide conversations with your team and with outside marketing agencies, providing you an opportunity to promote your law firm effectively into the new year and beyond.